LONDON--(BUSINESS WIRE)--The global artificial grass turf market is expected to post a CAGR of nearly 13% during the period 2019-2023, according to the latest market research report by Technavio. As per Technavio, the distribution channel expansion strategy by vendors will have a positive impact on the market and contribute to its growth significantly over the forecast period. This global artificial grass turf market 2019-2023 research report also analyzes other important trends and market drivers that will affect market growth over 2019-2023. Various strategies such as the expansion of distribution channels are being adopted by vendors in the global artificial grass turf market to extend their customer base and increase revenues. Many vendors are partnering with brick-and-mortar stores and e-commerce retailers. “A large number of synthetic grass vendors are entering the retail space to expand their customer base and strengthen brand recognition. They are making constant efforts to distribute and promote their products through physical retailers, distributors, and contractors as well as online shopping portals. Therefore, during the forecast period, many vendors are expected to expand their distribution channels by adopting an omnichannel strategy for growth,” says a senior analyst at Technavio for research on leisure products. This market research report segments the global artificial grass turf market by application (sports, and leisure and landscaping), distribution channel (offline and online), and geographical regions (APAC, EMEA, and the Americas). The sports segment held the largest market share in 2018, accounting for over 67% of the market. This application segment is expected to dominate the global market throughout the forecast period. 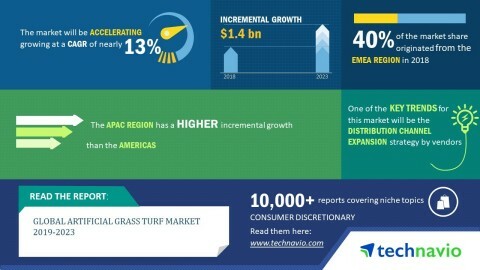 The global artificial grass turf market is expected to post a CAGR of nearly 13% during 2019-2023, according to the market research from Technavio.